Game Boy Houses 80 GB "Super Hard Drive"
From the just-because-I-can department: This modder stuffed an 80 GB drive inside a Game Boy, USB-enabled the case and then, for good measure, printed out that screen design and stuck it to the glass. 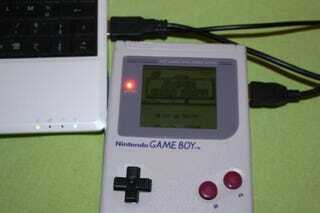 He even went so far as to match up the drive's LED indicator with the Game Boy's battery indicator. It's fooled a lot of people into thinking it still plays games with the drive shoved up it, but it doesn't. Either way, cool mod, nice conversation starter.